This is the first part of our cordless drill review series. 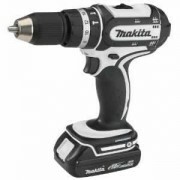 For a detailed overview and table of content please look at on the cordless drill review here. In our cordless drill review series, we begin with a look at the different categories in today's cordless power tool market. Among the first questions usually asked is "what kind of cordless drill should I buy," it is important to understand how many market segments there are. First Time Buyer - If this is the first cordless drill you are about to buy, begin to research the types of drills that are available. At this point you do not need to focus on a certain brand or model and are "relatively" free to decide what cordless drill to choose. Cordless Drill Owner - If you're already a own one or several cordless tools including a drill or two, you may want to purchase the same brand that are already in your workshop. One criteria will be to keep the battery pack and charger the same across all drills if possible. Regardless of which manufacturer you prefer, look first at the 5 different segments in today's cordless drills marketplace. Let's begin by reviewing the different voltage categories for the various cordless power tools segments. Lightweight screwdriver for quick and handy "out of the pocket" use. In past days the 9.6 Volt class was the "basic" class of cordless hand drills. This group of drills is diminishing, in favor of the 10.8/12 V cordless tools. Currently the compact cordless drill category for any woodworker. Very light weight and excellent in handling. A great power-to-weight ratio, makes the especially the 18 Volts class, the most important cordless drills category for carpenters, framers and roofers. 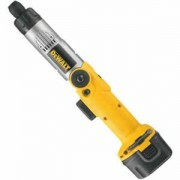 Traditionally the category for pneumatic or SDS cordless hammer drills. With tremendous torque and long lasting battery power. Over recent years, design of cordless drills has changed significantly. At first most brands offered only simple pistol-grip models with the battery pack fully inserted inside the handle. Since batteries became larger in size and weight, new cordless drills - especially with a higher voltage - came with mid-handle design. Easy to maneuver it can be quick "twisted" from straight to pistol grip. The stick-shape is most common on low voltage cordless screwdrivers. Once the most common handle type - the pistol grip - is now hardly found on any modern cordless electric drill. 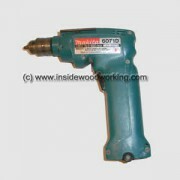 The picture shows an old (no longer manufactured) Makita cordless drill 6071D. The mid-handle is the most common shape found on cordless drills today. With "knob-type" cordless drill batteries half way outside the handle. It allows perfect balance especially on heavier units with battery packs of 12 V and above. 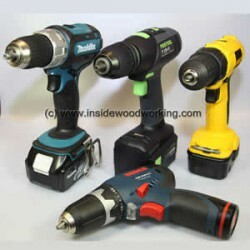 Today the cordless drill market is composed of mostly mid-handle shaped units. This gives the best between proper balance and compact design. We have been examining the main categories of cordless drills in the marketplace as well as some important features about drill handle types. In our next section lets have a close look and rate main components any professional cordless drill should have.